We helped move a few puppies from a temporary foster home. The ten puppies and their mother were taken into rescue. Half of the litter was moved to another temporary foster home while the mother and the other five waited for long-term foster homes. One of the puppies flew out to a new foster home and we took three to meet two transport volunteers to head to their three new foster homes. One puppy from this half of the litter is still waiting for a long term foster home. 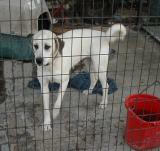 All of the rescue efforts were coordinated by the National Anatolian Shepherd Rescue Network. You can read more about them at www.nasrn.org. To my knowledge, all ten puppies and their mother still need permament homes. Edit: I believe that all of the puppies were placed. I am not sure about the mother -- I would have to check on her.